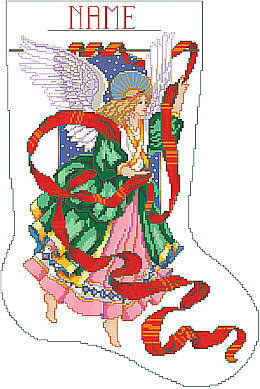 Bring the joy and beauty of the holiday spirit to your mantel with this easy-to-personalize stocking featuring a festive angel. Inspirational in design, it is a reminder for the reason behind our treasured Christmas celebrations. It is a heavenly Christmas gift for faithful family members, friends, teachers, neighbors, coworkers, or prayer partners. Contents: Stitch Count 136w X 191h, finished size on 14 count 10" X 13-3/4"